51 Lbs / square foot. Material - Each roll is constructed of 100% premium grade polyvinyl. Diamond Nitro Rolls were designed from the ground up to provide the best value roll out garage floor covering on the market. Note: Due to the manufacturing process, patterns of two pieces of flooring may not match or align exactly along the seam when two mats are laid side by side. Each roll is constructed of 100% premium grade polyvinyl. Nitro rolls have been used as roll out garage floor mats, as a wall to wall garage flooring, as workshop flooring, in storage sheds, as industrial anti slip flooring, and more. We know that returning items can be a huge hassle. As businesses continue to thrive it seems like they make it harder and harder for you to return merchandise. Fortunately at IncStores we know that feeling and do our best to make this process as easy as can be. Nitro garage floor rolls are easy to clean and maintain. Cleaning of this roll out flooring / matting typically includes. Sweeping, blowing off, or vacuuming any loose crumbs, dust, or debris from the tiles when necessary. For more difficult or liquid stains, the product can be cleaned inside or outside the garage using a mild soap and water solution and a broom or vinyl brush to scrub the floor surface. Note: This is not a stain proof product. Leaving certain harsh chemicals on the rolls for an extended period of time may cause some staining and/or damage. Street tar can cause staining to light colored rolls and in most instances this staining can be remedied with a cleaner called Purple Power. If you have performance tires, staining can occur with light colored rolls. In most instances this may not be remedied with a cleaner. If the staining on your floor does not dissipate, please contact our dedicated Customer Service team at who can further assist you. Modular Grid-Loc Tiles are easy to install. Installation of these floor tiles typically includes. Clean your sub floor so that it is free of all dirt, dust, grease, or other foreign material. SWhen installing the Grid-Loc tiles, we recommend starting in the front left corner of the room and working your way out from there. Make sure the female side (loops) of the tile is facing away from the wall. After filling the left wall with tiles and the adjacent wall, proceed to fill the rest of the room with whole tiles. When you come up to a wall or object, dont worry. Just measure the area and cut the tiles with a sharp utility knife and put the trimmed tiles into place. When trimming the tiles into place, make sure you leave about a 3/4 space between the tiles and the wall or obstruction. Note: Since our Modular Grid-Loc tiles feature a vinyl top adhered to the tile with a pressure sensitive adhesive, pressure may be needed to ensure that the vinyl top is fully adhered. You can easily accomplish this by walking across the floor or by using a flooring roller for larger areas. The item "IncStores Nitro Commercial Grade Garage Flooring Mats Coin & Diamond 7.5' x 17" is in sale since Wednesday, June 29, 2016. 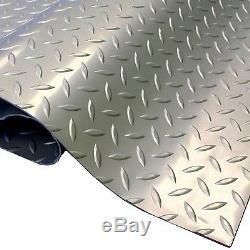 This item is in the category "Home & Garden\Home Improvement\Building & Hardware\Flooring & Tiles\Other Flooring". The seller is "incstores" and is located in Chandler, Arizona.